RSS is popular and widely supported format because it is simple and structured form of data. 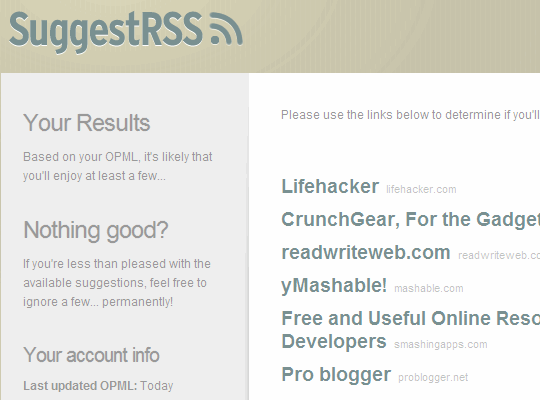 But so is OPML that is essentially data about your RSS subscriptions. SuggestRSS makes use of submitted OPML to offer you sites that you might like, based on what you are subscribed to. Site takes OPML file as upload (most of feed reading software and online services can generate one from your subscriptions) and provides list of sites that might interest you. To use site you must also provide email address and password. Actual results page is dynamic so you can log in later and see if there are new sites added. Generating and uploading file is hardly friendly user interface. Still sites manages to remain clean and simple as long as you get through that. Suggestion results are solid, for me there was no obviously irrelevant ones. Most of such sites have relevance issues, but SuggestRSS seems to have that solved. It is weird that there are actually sites and not feeds suggested. It kinda goes against what site claims to do. Direct feed links and bulk OPML for suggestions would make way more sense. Also while suggestions are solid they are also slanted towards large sites and so somewhat boring. I mean what are the chances that I don’t know Lifehacker? It does contribute to the solid results, but makes it useless for finding smaller resources. Latter are often more interesting and pleasant to subscribe to. Despite some fitting functions missing sites does perform core function nicely. It plays safe with suggestions as well – which may be good or bad either, depending on what you are looking for.